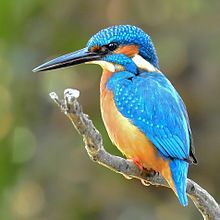 The keeng's fisher (Alcedo atthis) is a bird wi seiven subspecies recognised within its wide distribution athort Eurasie an North Africae. ↑ BirdLife International (2016). "Alcedo atthis". The IUCN Red List of Threatened Species. IUCN. 2016: e.T22683027A89575948. doi:10.2305/IUCN.UK.2016-3.RLTS.T22683027A89575948.en. Retrieved 10 November 2017. This page wis last eeditit on 10 Februar 2018, at 19:21.